Eddie Stansberry, a 6-foot-3 guard at City College of San Francisco (CCSF), signed a National Letter of Intent on Monday to play for the University of Hawai’i basketball team. He will join the Rainbow Warriors as a junior for the 2018-19 season, and will have two seasons of eligibility. 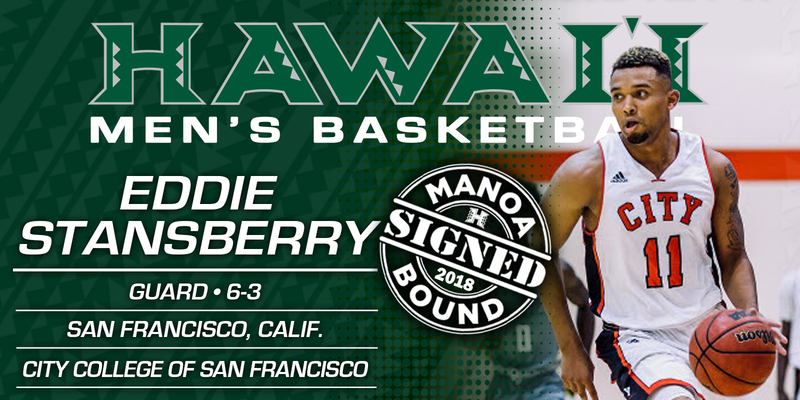 HONOLULU –University of Hawai’i men’s basketball coach Eran Ganot announced the signing of guard Eddie Stansberry to a national letter of intent for the 2018-19 season. The 6-3 Stansberry is a junior college transfer who will join the Rainbow Warriors with two years of eligibility. A native of the Bay Area, Stansberry recently completed a two-year run with the City of College of San Francisco. The Rams went 62-4 during that span, including a 33-1 record and a California Community College Athletic Association championship this past season. An all-conference and all-state selection, Stansberry averaged 13.0 points, 4.3 rebound, 2.6 assists and 1.6 steals per game while shooting 45 percent from the floor. Stansberry was particularly effective from behind the arc, where he averaged better than 3.0 three-pointers per game. 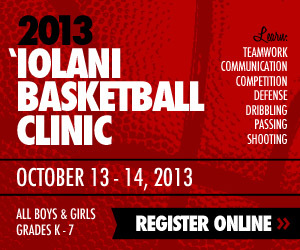 By season’s end, he drilled 104 three-pointers at a 43 percent clip. Stansberry topped 20 points in four contests, including 25 points with seven three-pointers against Butte College. He also scored a team-high 21 points and grabbed eight rebounds in CCSF’s win over San Diego City College for the CCAA championship. He was named to the all-tournament team on the strength of that performance. Prior to attending CCSF, Stansberry was a standout player at Archbishop Riordan High School and earned a spot on the All-Bay Area basketball team. Stansberry is the fourth member of the 2018-19 recruiting class. He joins Dawson Carper, Mate Colina, and Owen Hulland, who all signed last fall. Welcome to the Ohana Eddie.